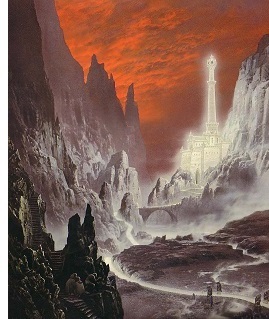 Minas Morgul - The men of Gondor built a tower on the western end of Mordor to keep watch on Sauron and to protect from a possible invasion from that land. But early in the Third Age it was overrun by the enemy and became the home of the Nazgûl. "And in the days of Telemnar, the third and twentieth of the line of Meneldil, a plague came upon dark winds out of the east, and it smote the King and his children, and many of the people of Gondor perished. Then the forts on the borders of Mordor were deserted, and Minas Ithil was emptied of its people; and evil entered again into the Black Land secretly, and the ashes of Gorgoroth were stirred as by a cold wind, for dark shapes gathered there. It is said that these were the Úlairi, whom Sauron called the Nazgûl, the Nine Ringwraiths that had long remained hidden, but returned now to prepare the ways of their Master, for he had begun to grow again.